Today I attended the official opening of the "2nd Venezuelan Week 2007" in Wisma SGM in Jalan Imbi. The event was launched by some Datuk fom some Ministry and the Ambassador of Venezuela in Malaysia. 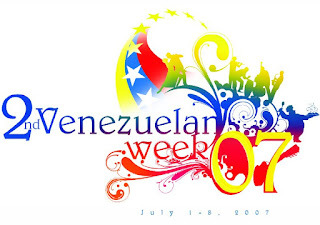 Excerpt from tbe brochure: "The first Venezuelan Week held in Malaysia in July 2006 allowed the Malaysians to get to know the Venezuelan culture and at the same time to enjoy a festive atmosphere on the occasion of the 195th Independance Day of the Bolivarian Republic of Venezuela. ".. include events such as Salsa Concert.. Venezuelean Gourmet Festivals, Charity Gala Dinner.. "
If you are interested to check out some cultural stuff, click here.